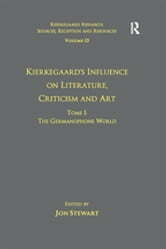 While Kierkegaard is primarily known as a philosopher or religious thinker, his writings have also been used extensively by literary writers, critics and artists worldwide who have been attracted to his creative mixing of genres, his complex use of pseudonyms, his rhetoric and literary style, and his rich images, parables, and allegories. The goal of the present volume is to document this influence in different language groups and traditions. 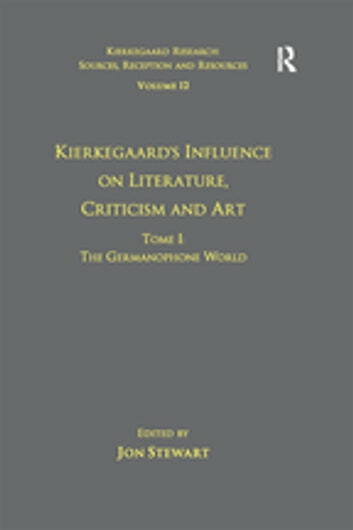 Tome I explores Kierkegaard’s influence on literature and art in the Germanophone world. He was an important source of inspiration for German writers such as Theodor Fontane, Thomas Mann, Rainer Maria Rilke, Alfred Andersch, and Martin Walser. Kierkegaard’s influence was particularly strong in Austria during the generation of modernist authors such as Rudolf Kassner, Karl Kraus, Robert Musil, and Hermann Broch. Due presumably in part to the German translations of Kierkegaard in the Austrian cultural journal Der Brenner, Kierkegaard continued to be used by later figures such as the novelist and playwright, Thomas Bernhard. His thought was also appropriated in Switzerland through the works of Max Frisch and Friedrich DÃ¼rrenmatt. The famous Czech author Franz Kafka identified personally with Kierkegaard’s love story with Regine Olsen and made use of his reflections on this and other topics.